I’ve often wondered what it must be like to have a twin, especially an identical one. You could see how clothes would look on you before trying them on, or what a hairstyle might look like, too. Even better, maybe you’d have some sort of link – either physical or mental – to that twin, as many twins claim to have. Twins appear in movies quite a bit, but every pair is different from other pairs. For the purposes of this article, I’m only using twins that were played by two separate actors, regardless of whether those actors were actually twins. It seems hard to believe that Julius and Vincent could be related – let alone twins – until you consider the fact that the brothers were the result of a scientific experiment that blessed Julius with all the best traits from his donor fathers and rendered Vincent as the walking embodiment of all the genetic garbage and crud that was left over. Naturally, the two brothers work together to discover the true nature of their origin and ultimately start their own consulting business. 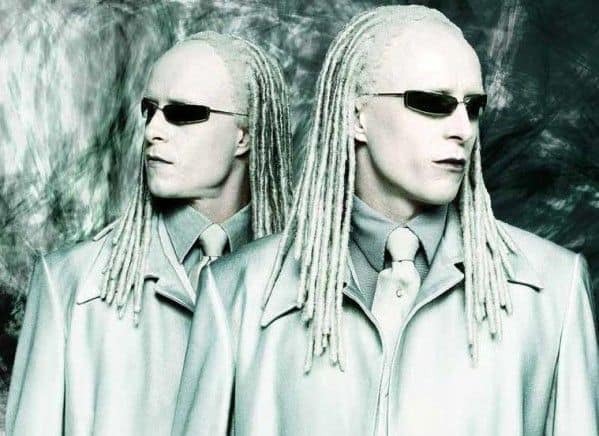 The Twins in The Matrix Reloaded remain unnamed throughout the movie, but would names really add anything to a pair of albino, dreadlocked programs with the ability to phase in and out of the construct that is The Matrix? Presumably, The Twins are a pair of exiled programs that sought refuse with The Merovingian, and are likely the “ghosts” to which the Oracle was referring during one of her conversations with Neo. Initially presented as a “gift,” hot twins Winkie and Blinkie introduce Jim Carroll to cocaine, telling him that while on it, he’ll be able to f*ck like Superman. Too bad they didn’t tell Jim about the crash. Later in the movie, Jim tries to confront the twins, only to encounter their father and have the girls pretend like they never met him. To quote the notorious Rick James, cocaine is a helluva drug. Although their appearance in the animated G.I. Joe movie (which is sure to be superior to the upcoming live action version) is brief, Tomax and Xamot always seems to leave an impression. The twins are practically mirror images of one another, save for the nasty scar down the side of Xamot’s face, and provide a textbook definition of Corsican Syndrome, as they’re able to finish each other’s sentences and even physically feel pain if the other is hurt. Sci-fi’s – and perhaps cinema’s – most famous twins are Luke and Leia, son and daughter of Anakin Skywalker and Padme. Of course, you know that it’s not revealed until later in the original trilogy that Luke and Leia are even related, making the subtle flirting and sexual tension seen in A New Hope all the more unsettling. Fred and George Weasley, older twin brothers of Harry Potter’s friend Ron Weasley, are known for their practical jokes and general mischief in Hogwart’s. They both show a lot of school spirit, however, especially when it comes to Quidditch and Gryffindor House. Unlike Ron, Fred and George are confident, competent, and pretty good with the ladies, too. As the name of the movie implies, Walt and Bob are conjoined twins. They don’t let that get in the way of, well, just about anything, as they still manage to pursue careers, play sports, and bring home girls from bars. The two start to fight a bit after Walt pursues his dream of becoming an actor and lands a television show co-starring Cher. In one of the funnier scenes of the movie, Bob’s stage fright takes over and he has to breathe into a paper bag while Walt acts. Starring Peter Paul and David Paul – better known as The Barbarian Brothers – Twin Sitters is the type of movie Hulk Hogan would have starred in if he had a twin brother. The movie is absolutely atrocious, but it’s tough to forget these two meatheads parading around on the screen. I am sure there are many other twins in movies, but the above eight are the ones I remember most. What are some of your favorites? Let me know in the comments section.